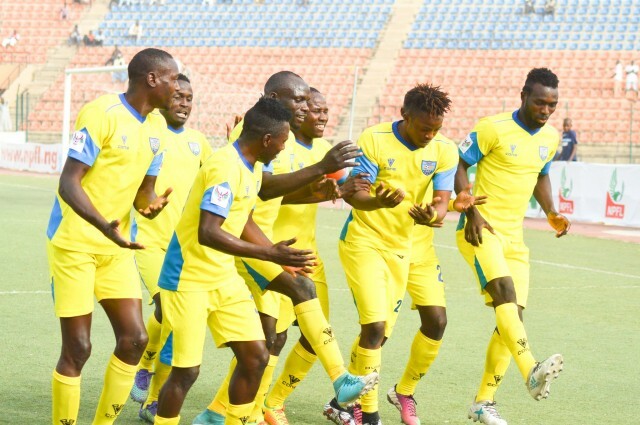 Newly promoted Gombe United and reborn Akwa United went goals gaga on Monday as the Match Day 8 programme of the 2018/19 Nigeria Professional Football League (NPFL) was concluded with games at three different centres. Abdulazeez Yusuf and Musa Usman scored a brace each as Gombe United trounced Nasarawa United 5-2 at the Pantami Stadium while Ndifreke Effiong also hit a double for Akwa United in their 4-0 success against Kada City at the Nest of Champions. Yusuf opened scoring for Ladan Bosso‘s men in the 10th minute when he powered home a pass by Usman. Nasarawa drew level through Emmanuel Makama’s penalty in the 19th minute but Gombe soon went back in front three minutes later with their own penalty which was converted by Usman before Yusuf got his brace five minutes to the break for 3-1. Striker Adamu Mohammed got in on the act by scoring his side’s fourth but if Nasarawa had nursed hopes of an unlikely comeback after Sunusi Ibrahim reduced the deficit in the 78th minute, Usman diminished such quickly with his second goal of the day four minutes later. In Uyo, Ndifreke Effiong was the star of the show as he scored two goals and created another in Akwa United‘s 4-0 win over Kada City at the Nest of Champions. The forward set up Mfon Udoh for his fourth goal of the season in the 6th minute before the former Abia Warriors star doubled his team’s lead by finishing Etim Mathew’s cross. Wisdom Fernando scored his first senior Akwa goal in the 61st minute to make it 3-0 before Effiong completed his brace (also his fourth goal of the season) in the 65th minute to wrap up scoring for United who sealed a third consecutive victory. Sunshine up to 2nd on the table. In the day’s other game, nine-man Katsina United put up a dogged fight but went down 0-2 to hosts Sunshine Stars who also had a man sent-off in Akure. Joshua Agboola and Samuel Tswanya were sent off in the opening thirty minutes for the visitors whose resistance was eventually broken in the 66th minute by Dayo Ojo‘s long range strike. Sunshine left back Seun Olulayo then received a red card in the second minute of stoppage time but there was still enough time for Fuad Ekelojuoti to score his team’s second. Victory takes Akwa United to fourth position on the Group B log while Gombe United leave the foot of the table to ninth. Sunshine Stars on the other hand climb to second spot on the Group A table just above Enyimba and behind MFM.